PTE PETER HIGGINS 7TH R.S.F. Brothers Peter and John Higgins were both killed in World War I. Peter was born on 16th April 1886, the first of a family of seven born to Peter Higgins from Ireland, and Ellen Murray, a printfield worker from Bridge of Weir who formalised their marriage in Houston, Renfrewshire on 16th July 1886. In 1891 Peter (27) and Ellen (29) with their first two children, Peter (4) and Agnes, were living at Young's Land, Kilbarchan, Renfrewshire. Peter was a mason's labourer. 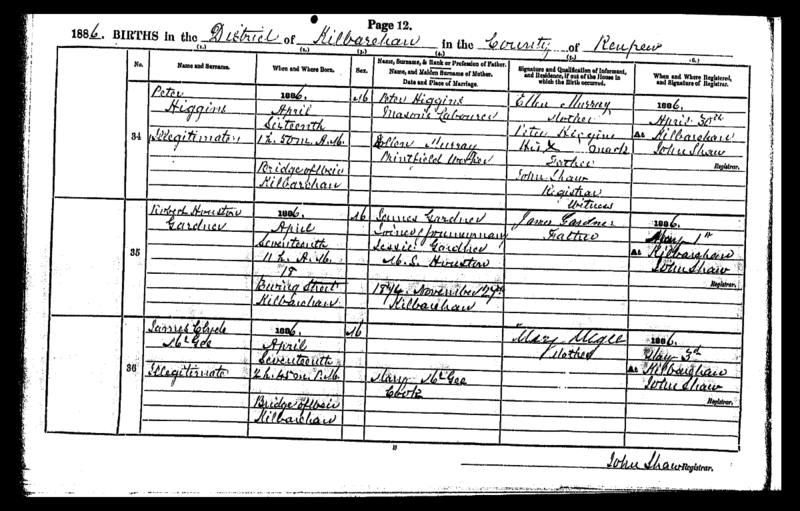 An aunt, Ellen Dogherty (56), a washerwoman from Kilbarchan, was living with them on the night of the census. In 1901, the family, now of eight, was living in a two roomed flat in Cameron Place, Bridge of Weir. Peter senior was by then a jobbing gardener and Peter junior (14) was a labourer in a tanning works. In 1911 the family was still in Cameron Place and Peter senior was then a currier's labourer. Agnes was a general servant; John (19) was a postman and professional golfer; Helen and Katie were factory workers at Printfield. Peter junior was not in the family home. Prior to Peter volunteering for active service in September 1914 he was employed in the Gryffe Tannery. He was enlisted in the 7th Battalion of the Royal Scots Fusiliers which formed part of 45th Brigade, 15th (Scottish) Division, and he first joined the theatre of war on 10th July 1915 in France. He survived the Battle of Loos in September 1915 and returned to his home in Cameron Place on seven days leave in January 1916. On 27th May 1916 Peter was reported as wounded by shrapnel in France but improving in No 3 Hospital. Earlier that month his battalion had been involved in fighting near Loos defending a German attack on 'The Kink' Salient, and counter-attacking with bombers (grenade parties). He was repatriated but did not survive a further operation to remove a piece of shrapnel which had lodged in his back. His funeral was on 10th June 1916, with military honours, the cortege leaving from his parents' house in Cameron Place. Peter was the first of the two Higgins brothers to fall. Their names are recorded in a stained glass memorial window in St. Fillan's Church, Houston. 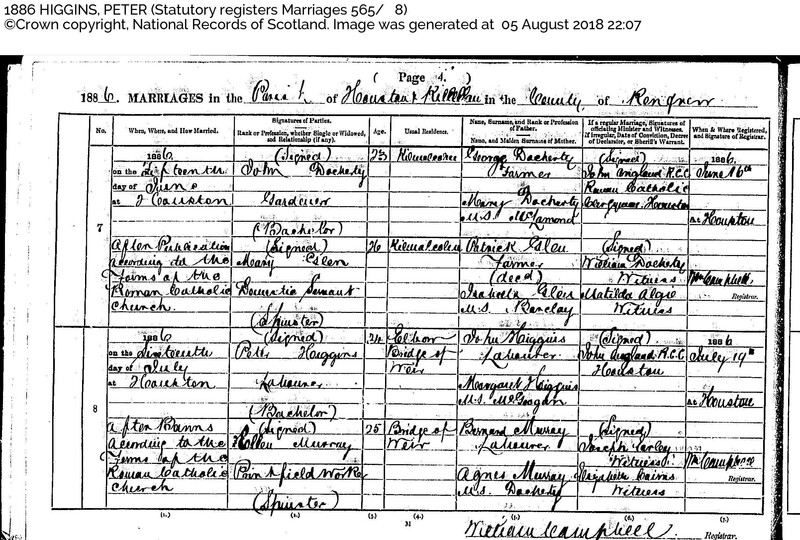 Peter Higgins & Ellen Murray marriage certificate 16 July 1886. Regd Houston, Renfrewshire 19 July 1886. Peter Higgins birth certificate, 16th April 1886. Regd. Kilbarchan, Renfrewshire 30th April 1886. 1891 UK Census: Parish: Kilbarchan; ED:8; Page:10; Line:19; Roll: CSSCT1891_185. 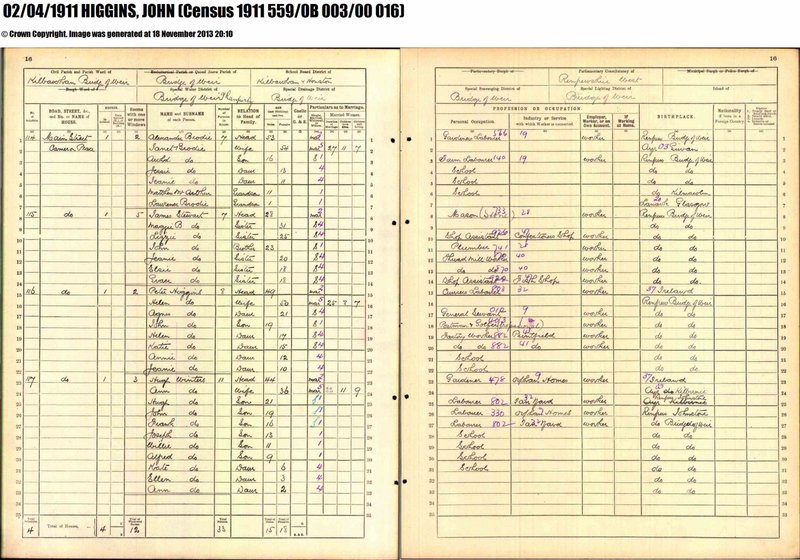 1901 UK Census: Parish: Kilbarchan; ED:3; Page:22; Line:11; Roll: CSSCT1901_188. Unit War Diaries: WO05/1947/2 6/7 Battalion Royal Scots Fusiliers. May 1916-Jan 1918. National Archives. VERMELLES. 6 May 1916. In reserve trenches. Enemy shelled trenches but not heavily. Working parties to R Scot R.E. 7 May 1916. Moved up and took over Right sub-section HOHENZOLLERN SECTOR. 10 May 1916. -do- 11th Moved into reserve trenches. 11 May 1916. Headquarters VERMELLES. Germans attacked 13 Royal Scots who relieved us, about 5pm. A&D Coys moved to RESERVE TRENCH rt of HULLOCH ALLEY to support. Royal Scots C&B COys occupied LANCASHIRE TRENCH. 7pm, A Coy less bombing party moved into OB1. D Coy less bombing party T Heads in GORDON ALLEY. Bombers of D Coy under 2/Lt Cooper started to bomb up GORDON ALLEY, party under 2/Lt Watson A Coy bombed up HULLOCH ALLEY. 2 Platoons from B Coy reported to CO Royal Scots for bomb carrying from battn stores forward. 2 platoons B Coy, 2 platoons C Coy went into VILLAGE LINE N Junction KEEP. JUNCTION KEEP occupied by 2 platoons C Coy under an officer. Battn Hqrs were established in VILLAGE LINE N of JUNCTION KEEP. 2nd in command Capt Paton went up to front line to take command of operations. Time 8 pm. Bombardment & Bombing continued. CO & adjutant went up 10 pm & took up a position in OB2 with telephone communication to rear. Communication to front was by runner. 12 May 1916. At 1.30 am, 7 RSF lanched counter attack with A Coy from SACKVILLE ST. between GORDON ALLEY & HULLOCH ALLEY. The attack was made on ANCHOR TRENCH & though carried out with utmost gallantry, failed on account of heavy enfilade fire from enemy machine guns. Word was received from Brigade to consolidate where we were. This was done & the line stood. From left. KAISERIN TRENCH, POKER ST., CLIFFORD ST., SACKVILLE ST. Our extreme Rt was junction of latter with HULLOCH ALLEY. Our extreme left, SAVILLE ROW. We established bombing posts in KAISERIN TRENCH, CLIFFORD ST, GORDON ALLEY. The rest of the day was quiet. 13 May 1916. Amalgamation with 6th Battn, who joined us in the trenches. The correspondng Coy of the one battn joined the corr Coy of the other. 14 May 1916. Day quiet until evening. About 4.15 pm we received instructions from Brigade re counter attack at night. The main attack was being carried out by 46th Brigade on our right. At 6 pm, our machine guns enfiladed BOYAU 99 held by enemy. At same time our Artillery opened heavy fire on BOYAU 99, & ALEXANDER TRENCH. At 6.30 pm our bombers cleared our barricade in GORDON ALLEY & commenced to bomb up trench. They were held up at enemy sap head, but continued bombing till 8pm which time we received orders from Bgde to return to our original post & hold fast there. The enemy bombardment was heavy, SACKVILLE ST & parts of GORDON ALLEY being levelled to the ground - also VIGO ST. Conditions became normal by 9.30pm, & work in trenches was done by both sides. 15 May 1916. Occupied right sub section with 2 Coys in firing line, 1 in SUPPORT (OB1), 1 in Reserve (RESERVE TRENCH). 16 May 1916. Day quiet. 17 May 1916. 11am-11.30am, heavy shelling on VIGO ST., & field guns OB1. Otherwise quiet. 18 May 1916. 1am-2am - wired SACKVILLE ST between GORDON ALLEY & HULLOCH ALLEY. VIGO ST built up where blown up. 19 May 1916. Relieved by 8/10th Gordons. Proceeded by Coys to billets in SAILLY LA BOURSE. 15th January 1916: Home on 7 days leave having survived the tragic Battle of Loos in September, with Private William McKenzie, Black Watch. 27th May 1916: Friends of Private Peter Higgins, who was wounded by shrapnel in France, will be pleased to hear that his condition is improving. He is lying in No3 Hospital at this time. 10th June 1916: MILITARY FUNERAL: The funeral of Private Peter Higgins, of the Scottish Fusiliers, took place on Thursday from his parents' house, Cameron-place, with military honours. Pte. Higgins was reported in these columns only a fortnight ago as making progress, and up till a few days ago every hope was entertained of his recovery; but owing to the necessity of a further operation in order to remove a piece of shrapnel which had lodged in the back, his strength had not been sufficient to withstand the ordeal. Private Higgins was employed in the Gryffe Tannery previous to his enlisting. Much sympathy is felt for his relatives. 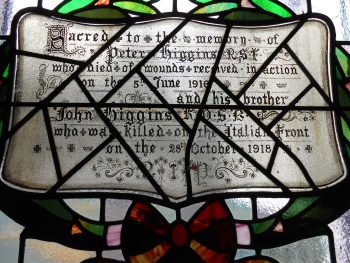 7th June 1919: IN MEMORIAM: In loving memory of Private Peter Higgins, RSR, who died of wounds received in France, June 5th 1916; also his brother, Lance-Corporal John Higgins KOYLI, who was killed in action in Italy on October 28th 1918-RIP. o	13023 Private. P. HIGGINS Royal Scots Fusiliers 5th June 1916 aged 29.
o	Sacred to the memory of Peter Higgins R.S.F. who died of wounds received in action on the 5th June 1916 and his brother John Higgins K.O.S.B. who was killed on the Italian front on the 28th October 1918.